The best wedding bands know how to make the night memorable with the best soundtrack, to heighten the moment’s memories and emotions with the best wedding songs. 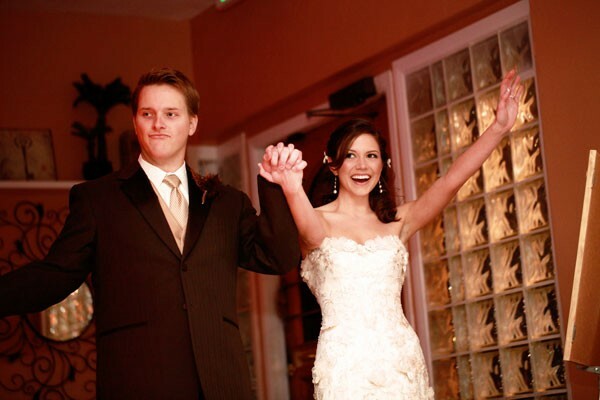 When picking out your wedding entertainment or wedding singers, you will want someone who’s an expert in picking out wedding songs that capture this once in a lifetime event, that you can relive every time you think of or hear those songs. As your main wedding band contact in Melbourne and Sydney, let’s have fun and look at our expert picks for the top 30 bridal entry songs for weddings. First, let’s set the scene. You’ve already walked down the aisle, gone through all the emotions of the ceremony, and the dinner, and the toasts, and the happy tears, and you’ve had the perfect wedding music to accompany each of these moments beautifully. But now it’s time to let loose. It’s time to let go of the formalities, and celebrate everything about the day, going out at a climactic peak. Everyone’s ready and waiting for permission to join you in letting their hair down, and you’re going to set the tone when you step out with the bridal party. Now that we’ve built up the suspense, much like all the planning did leading up to this perfect wedding day, let’s release the tension. 1) Uptown Funk, by Bruno Mars. 9) Bring ‘Em Out, by T.I. So there it is! And that’s really just the start of your options. If you have a special song to start out the party, we will cater to it, as we pride ourselves in music that caters to everyone! We perform a very broad range of songs for weddings from the 60’s, 70’s, 80’s, 90’s right up to now, and we cover all styles of music! We play modern and classic pop, rock, jazz, soul, funk, blues, hip hop, latin, and so on and so on! Individually, Lily Road band members have recorded on albums and shared the stage with artists such as: Taylor Swift, John Legend, INXS, Will Singe, Angus and Julia Stone, Pete Murray, The Whitlams and Guy Sebastian just to name a few. If you’re looking for a Sydney wedding band or Melbourne wedding band and are looking for the best wedding singers to make your favorite songs come alive and make the night as memorable as you deserve, please contact Greg here or at greg@lilyroad.com.au, and let’s get started with the fun of planning your amazing wedding songs for your special day!